I still love this sketch! And as I make more and more gift items Mewsette and the colorful afghan are a popular theme. I wanted to see what it would look like without the white edges, and I think I like it this way too. Mewsette on the Afghan tile. Here is Mewsette on a tile! She sells out pretty quickly, so the next time I make them I’ll make several of Mewsette. You can find this artwork printed on paper and canvas in various sizes, giclee as well as digital prints and as the mousepad shown, as a laminated placemat, keepsake box, gift box and gift bag, and maybe a few more things, on Portraits of Animals. To find other products and handmade goods bearing this art, search my website for the title. They’d been bathing each other and fell asleep. What could be sweeter than two cats in such a simple embrace? It’s Mr. Sunshine and Jelly Bean. And I just wanted to capture the essentials. I didn’t want to overwork this one. Laminated Placemats from Portraits of Animals! 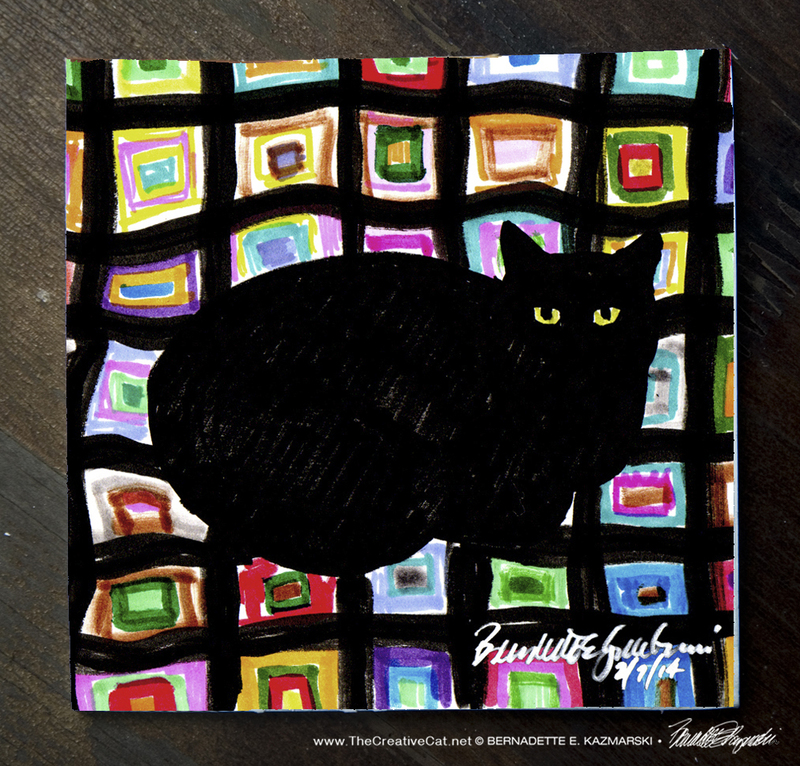 “Mewsette on the Afghan” placemat. Placemats are available in 11 x 17 and 8 x 10. Placemats are printed on one side of 110# matte cover stock and then laminated with 5 mil laminate. They can be used for water and food bowls as well as placemats for your table, or any surface that needs a little protection. Read more and purchase. ← Daily Photo: Mariposa Haz Ninjas!